I can sing a Rainbow, can you? “Red and yellow, and pink and green, purple and orange and blue” *hums* Happy Sunday everyone! I’ve got some great colourful pieces to show off for you today! I know, me and lots of colour, surprising isn’t it 😛 . 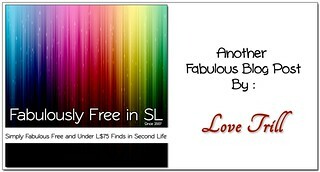 I know you all are big fans of the SLF&O group, and the many gifts that are available for members. 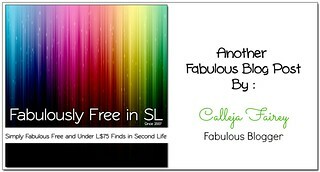 Well, one of my favourite designers that puts out SLF&O group gifts, has just switched out her previous gifts for new ones! I’m talking about Livalle. Sticking with the previous format of 3 pairs of shoes in 3 different heights, she has done the same with some pretty, perfect for spring, shoes. Each pair comes with Maitreya, Bellezza, and SLink versions, so most of you meshy feet wearers should be happy. To remind you all, the SLF&O group is free for you to join, and the gifts are free to grab with your tag on. The first pair, in mint, is a maryjane style heel, meant for the mid range feet. They are called Wednesday, but obviously will work for any day! The second pair. in Lavender, are a great, strappy high heel for high feet. Their name is Rhiannon. Lastly, the third pair, is a sweet Pink and Black flat, named Rosetta. I love the little bows. Now, did you notice the dresses I had on in each picture? These lovely, bright, geometric printed dresses are from Somnia, and you can pick up a fatpack of 5 colour combinations over @ Free*Style for only L$50. That’s L$10 a dress! They are mesh dresses, available in the standard sizes, in each colour combination. I should mention that I’ve heard the Free*Style shop will be undergoing some reno’s soon, which will also include a changing of all the great items that are there. So these dresses will not be available after that. I can’t tell you when this is happening, so I would not chance waiting too long, and head over right away. So many other great deals to be had, all items priced L$50 or lower, from so many great creators, you do not want to miss out. Last thing before I leave you all. The Creators Collection Box is celebrating their 1st anniversary, and so almost every store that has a booth set up there, has also placed out a free gift for you. The 3 poses I used for my pictures are the gift you can grab from addme poses. I love that they include each individual pose, a pose hud, and a pose stand, so you have your choice in how you use your poses. There is no need to join any kind of group, just find the little box that says it is the anniversary gift, and buy for L$0. Sorry, I forgot to check how long this one will be running for, so again, I wouldn’t wait too long before you head over. Categories: accessories, Animations, dress, events, Free, group gifts, mesh, poses, shoes, skirt | Tags: "7 Deadly S[K]ins", Addme, Bellezza, Calleja Fairey, Creators Collection Box, elikatira, elua, fab free, fabfree, fabulously free in SL, fashion, Freestyle, Ikon, L$0, L$50, Livalle, maitreya, Second Life, Second Life Frees & Offers, sl, SLF&O, SLink, Soiree, Somnia | Permalink. Hello Fabulouses!! I gotta say… Snow sledding was a lot less painful when I was 8! It is my personal recommendation that if you are over 30, you do not try this (I swear I felt every bump on the way down)… but if you are brave, this fun Sled Riding pose is a 1L dollarbie in the .::NaniKa::. marketplace store. Next time, I’m bringing a pillow! Make sure you are doing your daily visits to the free KittycatS Advent Calendar too! There are a ton of great designers participating, like Somnia who has gifted the Flurry Sweater you see me wearing. The Flurry Special includes a texture change hud too, so it’s a whole handful of sweaters in one! I forget which day it was in… but you can go back and grab previous days, so just open them all :). You’ll be glad you did. Categories: december advent, Free, Marketplace, mesh, poses | Tags: 1L, Advent, Blueberry, Bueno, dollarbie, dollarbie sl, fab free, fabfree, fabulously free in SL, Frisland, Ikon, KittyCatS, kittycats advent calendar, Lara Hurley, lelutka, Love Trill, Magika, maitreya, Marketplace, Nanika, Second Life, sl, SL Advent, Sledding in SL, Somnia | Permalink. Happy Saturday everyone! Sorry I’ve been absent this week so far, I’ve been having computer issues. Granted, it’s my own fault, I’m so impatient! My brother is the one who takes care of my computer for me, and I thought it would be smart to do an upgrade on my own as I didn’t want to wait for him to get home. Lots of head shaking and sighs in my direction later, he has fixed my computer for me, well, at least enough that I can be here with you all. I can’t help it, I hate waiting around!! That makes a perfect segue into what I am here to show you today! Lucky boards….I love them, but hate the waiting around! Those of you that are familiar with Somnia, know that this is the perfect place to go to get your lucky board fix, without having to wait around forever! On the second level of the store, there are a whole whack load of lucky boards, with super short timers. Seriously, I just need to stand around there for about 5 minutes, and can leave with a bunch of new items in my inventory. Each board has 1 clothing item, in a variety of colours, to win for free, ranging from dresses, to t-shirts, sweaters and skirts.. I’ve decided to show off the Boffle sweater set, and the Zhevios pants. I managed to win the pants in 3 colours, brown, peach and ice. The Boffle set, I won in 2 colours, ice and rose. Each piece is mesh, in the standard sizes. They combine to make such a nice, casual, yet well put together outfit! Like the pretty skin I am wearing? While searching around for the skins I will be showing off on Dec 1 for FabFree’s first ever free skin day, I found a skin that didn’t quite make the L$10 or less guidelines we were all following. It is still a great deal though, at only L$20, from Curves, this skin comes in a cleavage and no cleavage version, with appliers for Lola’s, Phat Azz, WowMeh, and SLink hands and feet. The lovely reddish brows even made me go ginger! This skin, along with many others, some for guys too, is on a table by the group join. Stay tuned for my skin post on Dec 1 to see the free skins I grabbed from there. OK lovelies. I must be off, by brother is looking to do the final fix on my computer for me, and he has the same type of patience I do, which means I need to hand it over. LOL. Until next time, TTFN! Categories: appliers, Free, group gifts, groups, Lucky Board, mesh, pants, shirt, skins | Tags: !BANG, Calleja Fairey, Curves, fab free, fabfree, fabulously free in SL, Ikon, maxi gossamer, moon, Second Life, sl, SLink, Somnia, Zalea | Permalink. Happy Wednesday everyone! I’ve noticed that I haven’t really done a Fall type post yet, and even though it is almost half way through November already (OMG, right! ), it is still very much Fall in my area, with only the smallest hint of snow so far. So I thought I’d play along with the weather, and do a cozy Fall, not Winter, post, and for fun, throw in Spring. Are you confused yet? LOL. OK, let me explain. Traditionally, sweaters are Fall territory, I think we all can agree there. However, the colours of Fall tend to be warm colours, darker, rich, cozy colours. As you can see in my picture, although my surroundings are screaming Autumn, the pretty pastel colours of my outfit, are more inclined to say Spring. Skirts also tend to be seen more in Spring and Summer, although not exclusively, and when I got dressed, I couldn’t decide what season I was best suited for. But, I guess I should just stop rambling and go ahead and tell you where to get this multi-seasonal look eh? LOL. The sweet pink sweater I have on, is the latest group gift from Amiable. I can’t get enough of the lips cutout, such a fun detail. Put out in celebration of the group hitting 1700 members, it is free with your group tag on. Even better, that group is free to join. My skirt is an older group gift from Amiable that is still available, and you might recognize it, kinda, as Love showed it originally HERE, in its darker blue version. It comes with a hud for you to be able to choose between the 2 colours. Both sweater and skirt are mesh, and come in the standard sizes. Make sure you grab all the other group gifts that are still available. I love an easy, slightly messy, updo, with the loose wispy bits making me think of a spring breeze, working perfectly with my Spring in Fall look. Lucky for me, and for all of you, the one I am wearing is from a new to me store called Bold & Beauty, and it is a free group gift! Avery comes in a full fatpack, with every colour you could possibly wish for, and is unrigged mesh, to allow for editing if you need to. The group is free to join, all you need to do is have your tag on to pick up your gift. There is a second hair gift for you, as well as a few clothing items, all free with the group tag. Alrighty, I must be off for now. I won’t be gone long though, as I already have some great stuff set up for another post soon. So, until then, TTFN! Categories: Free, group gifts, groups, hair, mesh, shirt, skirt | Tags: (marukin), Amiable, Bold & Beauty, Calleja Fairey, elua, fab free, fabfree, fabulously free in SL, fashion, free, free in sl, freebie, freebies, freebies sl, gifts, group, group gift, group gifts, Ikon, Ison, Pink Fuel, Second Life, sl, SLink, Soiree, Somnia | Permalink. It’s one of my favorite times of the year! 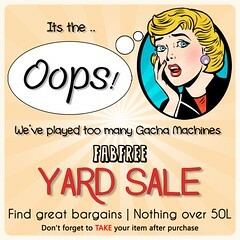 The Wash Cart Sale has arrived! If you are into amazing deals (and I know we are!) The Somnia cart is a must stop. It is packed full of great clothing and some of the cutest nails I have seen, and they all come with texture huds. This tunic style top and capris also have huds that allow you to change the faces interdependently, giving you even more options. Not ready to give up your summer wardrobe yet? Grab this Spring Fling combo. Sweet, and a little sassy, it’s perfect for the last, long says of the season. I paired these great outfits with a few of the current group gifts from Dirtystories, the Bunny Heels and Secret Necklace. Somnia packed their cart with more things that I could fit in one post, and there is even a free gift! I hope you all enjoy the sale as much as I have. Categories: accessories, fitted mesh, group gifts, mesh, Nails, pants, shirt, shoes, Uncategorized | Tags: "7 Deadly S[K]ins", 10L, Cart Sale @ The Wash, dead apples, Dirty Stories, dirtystories, fabfree, free, freebies, gifts, group gift, Moira Serenity, Second Life, SLink, Somnia, TRUTH | Permalink. Malibu and 7, sounds like a great idea for a drink! Well look at that, it’s Thursday already! So weird how a week will both drag by, and fly by…all at the same time. Time drags while at work, and then I come home, hop on SL, shop and boom, it’s midnight and I should be in bed. Luckily, as fast as the time seems to go, I still seem to find plenty of time to hunt for great deals to show off to all of you fab readers. Firstly, I have to tell you about my shoes!!! It’s been awhile, so I will remind you all, I…LOVE…SHOESSSS! 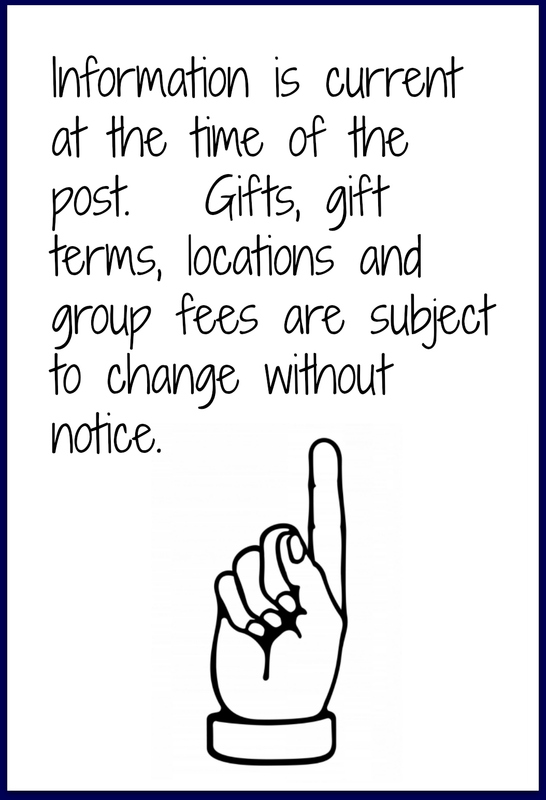 Naturally, when I saw the notice from Essenz last week about a new group gift, I ran right over! This newest release from Essenz, are the fun Malibu heels, for SLink, or Maitreya High feet, and the yummy pink version I am wearing, is the free group gift. The fee to join the group is L$350, but these shoes more than make up for that. Now, the other fab find I have to tell you about, is from [ glow ] studios. Until June 8, you can go on a special little hunt at their main store, for 7 different items that have been marked down to only L$27! There is a little bit of everything for you to find, however, since it is supposed to be a hunt, I will only give you a peek at one item. My pretty turquoise necklace in gold, is fittingly enough, called Tiny Secret, and as you can see, it is perfect for a plunging neckline. It didn’t take me too long to find all 7 items, so even if you are not a hunt-savy kinda av, I’m sure you will have no problem with this hunt. Categories: accessories, Free, group gifts, groups, jewelry, mesh, shoes | Tags: Calleja Fairey, essenz, fab free, fabfree, fabulously free in SL, fashion, free, free in sl, freebie, freebies, freebies sl, gifts, glow studios, group, group gift, group gifts, Heydra, Ikon, Lumae, Mynerva, Pink Fuel, Second Life, sl, SLink, Soiree, Somnia, The Cosmo Room, The Heat Wave Event, Tukinowaguma, Vestige | Permalink. The Heat Wave event at the Wash just keeps getting better and better! This is the Cart for Somnia and, as always, it’s full of fun beautiful items for us. I’m going back to the beach with the ‘Wave of Passion’ tank and the ‘Spring Fling Special’ shorts. Each of these items are just 10Ls! They both comes with a HUD to give you all the colors. The tank HUD even gives you the option to change the color of the belt and the belt clasp to suit your taste. I do love mixing and matching! Oh and those colors? They’re special editions for the Cart! The Somnia Cart is also offering us three nail styles for this round. The HUDs are included for Omega, Belleza and Slink Hands. Be aware, the SLink HUD only works on the Version 2.0 Slink hands and feet. 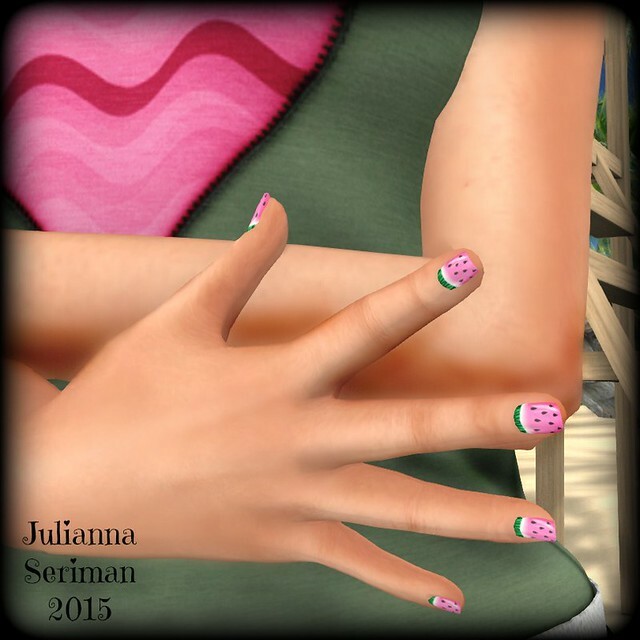 I picked out the fresh ‘Summer fruits’ HUD for ‘watermelon’ nails to go with my watermelon juice pop. My tasty treat is from Okaie and I found the pack of five flavors on the Marketplace for only 25L. The Heat Wave Event will only be around until June 10th then it will disappear like a melted popsicle…..
P.S. Don’t forget to pick up your free gifty at the Somnia Cart! Categories: dress, FabFree Headquarters, Free, Marketplace, mesh, Nails, shirt, skirt, Uncategorized | Tags: 0L, 10L, beach, Belleza Nails, dress, fab free, fabfree, fabulously free in SL, fashion, free, free in sl, free sl, freebie, freebies, freebies sl, gift, gifts, HUD, Ikon, Julianna Seriman, Lumae, Marketplace, omega, Omega Nails, Second Life, Sentinus, shorts, sl, SLink, Somnia, tank top | Permalink. So the 1980s called Pru, and said they totally wanted this outfit back. She said no way 1980s, I look rad! hahaha Seriously though, I’m very tempted to hunt down some leg warmers to go with this cute little dress by Pink Sugah. This partial mesh dress is a current FREE gift at the Bewbapalooza event. The dress comes with system layers, a mesh skirt piece, and appliers for Omega, Slink, TMP, and Lolas Tango. You will need to join the Bewbapalooza group to get it, however the group is FREE to join and there are several gifts to be had. Next up, I found this sweet jewelry set by Somnia as a FREE gift at the current round of The Thrift Shop. These bat-winged hearts come with a color change hud to adjust the color of the hearts, the metal, and an additional bead on the earrings. You can pick up the complete set for FREE when you stop by the Somnia booth at The Thrift Shop! The star of this post has to be this adorable kitten Pru’s got resting on her head. I think this kitty has the most adorable face! This little guy or gal is a FREE subscribo gift at Altair. All you have to do to bring him or her home is stop by the Altair main store and use the elevator at the entrance to teleport upstairs. Then click the subscribo and you’ll be gifted with your new kitten! Categories: accessories, appliers, dress, events, Free, group gifts, hair, jewelry, makeup, mesh, subscribe-o-matic | Tags: $0 linden, 0L, AD, Altair, analog dog, Bewba, Bewba gift, Bewbapalooza, cheapie, Double Take, fab free, fabfree, fabulously free in SL, fashion, Fashion in SL, free, free in sl, freebie, kitten, kitty companion, Lelutka Aria, Lumae, Maitreya Lara, Pink Sugah, Prudence Rexroth, Second Life, sl, SLink, Somnia, subscribo, subscribo gift, subscribomatic, The Chapter Four, The Skinnery, The Thrift Shop | Permalink. Hey there Fabulouses! I have returned to show you more of The Wash Cart Sale! In this post I am featuring the items that can be found at Somnia’s display. You will see me wearing the Squidgy Jumpers, Cheerio Skirt, Bees Knees Socks, and Nail Appliers in Donut Dark. All of the items on the Somnia cart come with fun texture change options for a few different mix and match options. There are four nail applier HUDS that are compatible with Omega, Belleza and Slink. As with everything else in the entire simwide sale, these items are 10L each! I also wanted to mention that the Pollock Cavalry Boots I am wearing are a FREE subscribe gift at Aphorism . 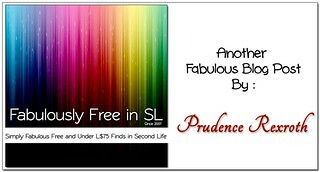 Simply subscribe and hit the display for your free copy. I am a big fan of these well made boots, so much that I have purchased them in other colours! There is a free gift for the guys too, so drag your guy or malt along! Categories: accessories, appliers, events, Free, mesh, Nails, shirt, shoes, skirt, socks, subscribe-o-matic | Tags: !Aphorism!, 10L, 10L sale, Cart Sale, event SL, fab free, fabfree, fabulously free in SL, free 0L, free boots SL, free fashion sl, free gift sl, free in sl, freebie 0L, freebies sl, Glam Affair, Ikon, Kirin, Love Trill, Magika, sale event, Second Life, sl, SLink, Somnia, Special One, subscribo gift, the wash, The Wash Cart Sale | Permalink. Good morning Fabulouses! Hope you all slept well 🙂 I had the most flippy floppy sleep ever, but I suppose that is par for the course when you are settling into a brand new bed. I don’t often show furniture on the blog because I am just not that talented at putting home displays together lol, but when I saw this bed as a 1L hunt prize I knew I needed to share the news! The Reveal Yourself Boat Crazy Bed is available at Never Totally Dead for 1L after you locate the hidden blue shoe for the Finding The Fairytale Hunt. You can find a hint giver at the main landing point. You can also find the mesh belted Wave of Passion Top I am wearing today as a free group gift in the Somnia notices. As you can see from the vendor ad below, this gift includes a texture change hud that allows for five shirt choices and several belt options as well. 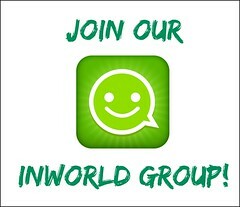 The Somnia group is free to join, and again – you will find this gift in past notices. 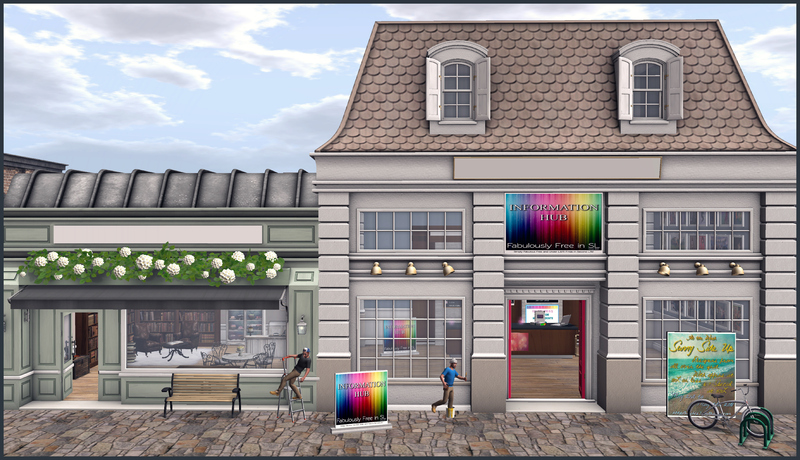 Categories: Free, furniture, group gifts, Home & Garden, mesh, shirt | Tags: !Aphorism!, 0L, 1 Hundred, 1L, fab free, fabfree, fabulously free in SL, FFT, Finding The Fairytale Hunt, free in sl, free in slf, free sl, freebies sl, FTFTH, Glam Affair, group gift, group gift 0L, Ikon, Love Trill, Magika, maitreya, Never Totally Dead, Second Life, sl, Somnia | Permalink.